Traficant's name will appear on the Ohio ballot. (CNN) - Former Rep. James Traficant gets to run for his old congressional seat after all. In early July, the Ohio Democrat - who spent seven years in prison on a bribery and racketeering conviction - fell about 100 names short of the necessary number of signatures needed to launch an independent bid as a candidate in Ohio's 17th congressional district. But the Mahoning County Board of Elections on Monday night determined that Traficant had secured 11 more petition signatures than he needed to qualify as a candidate. The announcement was reported by local media. The decision followed a summer long battle by Traficant supporters to get the former congressman's name on the ballot. The required number of signatures needed is 2,154, or one percent of the total votes cast in the district in the 2006 Ohio gubernatorial election. The former eight-term congressman, who represented Youngstown and its surrounding suburbs, told CNN in March he intended to run as an independent because, "I see the Democrats are completely controlled by foreign interests and big lobbying money - the republicans are too, but the Democrats more so." The 17th District, the seat Traficant formally held, is currently represented by Rep. Tim Ryan - a 36 year-old former aide to Traficant who is considered to be a rising star in the Democratic Party. After first capturing the seat in 2002, Ryan has won more than three-quarters of the vote in each of his re-elections. Pharmacist Jim Graham is the Republican nominee. Fool me once shame on you, fool me twice shame on me. So, don't listen to this crook. He definitly has the qualifications to be in this administration. Fellowny Alumni. A group of the old Good Fellas? What Greek letters do they use I wonder? We all have our warts but only a democrat could have the arrogance to run after a prison stint. He's been explicit about the lock the Zionist lobby has on US politics. No doubt a factor in his troubles. Kudos to him, the perpetual bad hair day notwithstanding. How is this happening, I thought once convicted you are not allowed to vote, or hold office. What is this, a new law for a few chosen? Only in America can a white convicted ex-con be encouraged by the "powers that be" to run for congress and represent thousands of law-abiding citizens, while our black President is practically forced to carry his birth cetificate on him and accused of usurping the most investigated and highest office in the land. My America. What a country! Save us from the corrupted felons of the Democratic Party! This clown may have been Tom Delays daddy,its in the genes. Great – well at least he is an "open" crook. The rest of them will welcome him with open arms. Since when did this Country stoop so low as to allow a convicted felon to get his name on any type of ballott. He should not even be allowed to run for dog catcher. Ohio – be wary. Oh yea, I forgot, Boehner is from Ohio. Nevermind. You guys get what you deserve! ....Traficant is a crook, and he really should not run, I would not vote for him. I am blunt and even harsh on Republicans, but I feel the same way about corrupt Democrats (unlike most Republicans, who have no such scruples or conscience). 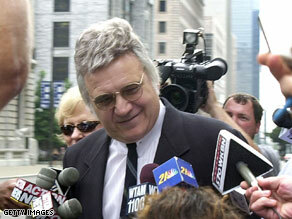 Traficant was an anti-Semite when in Congress, and I doubt he is less of one now. Perhaps he is simply a self-hating Jew. I mean if a gay Republican can hate gays more than anyone else, what else explains Traficant's obsession with Jews and their exercise of their rights as American citizens to address their concerns to their own elected Members of Congress? I mean, it isn't a sin to actually be effective... not that Traficant has anything to worry about. He sucked as an effective Congressman failing to deliver for his own constituents. He was, however, a good friend of the PLO when they were still a terrorist organization. When people like Traficant, Bachman, Beck and other think that the small delusional crowd that surrounds them lofting praises upon them are representative of the population as a whole, we have a problem. These nuts from the left and the right have no place in American politics. SIT DOWN AND SHUT UP TRAFICANT! How is he any different than some of the others still in Congress? I can't believe how much nerve a Democrat can have, and still expect to be elected.....again! Stupidity at it's finest.